In my previous post, I talked about three reasons why I’m not vegan: two of them were quite philosophical (how the life cycle works, as well as my religion) and a very important biological one: how the human body is designed for an omnivore diet. In this one, I’ll give you two more: health and the environment. I’ll also talk about the issue of animal wellbeing. Finally, you’ll find some tips, that I promise to follow too, in order to become the best alternative to veganism: ethical omnivores. Let’s go! Despite everything we’ve seen about the human body, there are a lot of people who insist that a vegan diet is the best one for our health. In order to do it, they usually turn to two strategies: praising the virtues of vegetable foods and demonizing animal foods. The first one is 100% corrects, but the fact that they’re good doesn’t mean they have to be the only ones. The second one normally hides a manipulation: they say the possible counter-indications of animal products, all of them, even the smallest ones, even the ones that only apply to certain populations or to specific illnesses, even the ones that aren’t demonstrated by any serious study (counter-indications that, by the way, we also find in the vegetable world, although those ones are silenced). And the benefits for a moderate consumption of animal products aren’t mentioned, even if they meet all the opposite characteristics. that only apply to certain populations or to specific illnesses. Even the ones that aren’t demonstrated by any serious study. Counter-indications that, by the way, we also find in the vegetable world, although those ones are silenced). And the benefits for a moderate consumption of animal products aren’t mentioned, even if they meet all the opposite characteristics. Of course there are people that become much healthier when they adopt a vegan diet. As it happens with every diet that implies paying more attention to what we eat. The basis of all diets that succeed in making people lead a healthier lifestyle doesn’t lie in the particularities of each one, but in what they share: prioritizing real food before ultra-processed, eating more veggies, learning about macro and micronutrients… all of that accompanied by habits like working out, etc. That is: being mindful and caring. But between someone who does that on an omnivore diet and someone else on a vegan diet, the scale will tip in favor of the first one (generally speaking, because then we have to take into account hundreds of factors, some of them genetic). And a vegan that eats ultra-processed vegan food all the time and spend the day on the couch will be less healthy than an omnivore who cares about his diet and works out reasonably. The total context is what determines health, we can’t attribute magic properties to stopping to eat animals. As any diet that implies cutting of whole groups of foods, it can cause multiple nutritional deficiencies, that maybe aren’t obvious in the beginning, but become serious as years go by. I already mentioned in my previous post several elements that are very difficult or impossible to get through a vegan diet and that are however indispensable for the organism. Still, many vegans, instead of warning about it and proposing solutions, ignore the problem and claim such deficiencies don’t exist. For example, with comparisons between animal and vegetable food saying that the second ones have in fact much more protein (or omega 3 fatty acids, etc.). Be careful with this kind of comparisons. Leaving aside the issue of the quality of those proteins and their bioavailability, they usually imply another manipulation: they take into account either only calories or only weight when it comes to telling their protein content, omitting the one that doesn’t go well with their theory. For example, they say: “Almonds have almost double proteins than eggs”: right, per 100 g almonds have 22 g protein, and eggs only 12 (all those numbers are from MyFitnessPal). But eating 100 g of almonds (which is a lot) implies consuming 632 kcal, whereas eating 100 g of eggs (the average weight of 2 eggs is 120) will give us only 146. They’re therefore a quite more efficient source. I was going to do the same thing with that comparison that goes around saying that broccoli has more protein than steak fillets, saying that the values they show are per 100 kcal, and how to eat 100 kcal of broccoli we’ll have to consume almost 300 g —would someone eat that?—, whereas a single fillet is already 100 g (150 kcal)… But even then, figures don’t square up, there are still 8’3 g of protein vs 16. So it’s plainly a lie. Always check the data before hitting the like button or sharing the information, especially when we’re not before a whole article with its context but just one image or graphic. In the nutritional field, we can rarely settle for simplifications, black and white, good and bad. There are a lot of factors into play, multiple correlations, we have to take into account genetics, lifestyle habits, the peculiarities of each person… and there’s still a lot to study about food itself, it’s a relatively new science. In general (again, with all the nuances you want) a little bit of everything is good, a lot of anything is bad. That is, variety and moderation. Apart from prioritizing less processed foods. What can’t be done is saying that for every person in the world the healthiest thing is to cut off a huge food group. Another motive that often makes people go vegan is the environment. And this time I can agree with them, because… the current meat production isn’t sustainable. Nevertheless, while I coincide in seeing the problem, I differ in the solution. I consider it’s better to support ethical meat production: being an ethical omnivore. And that is in the first place for everything I’ve already said: I don’t want to put in risk my physical health, and either my mental health (restricting food groups is a triggering for eating disorders). But it is also because I’m convinced that in the long term it’s the most beneficial option for the planet. The best systems are those that combine animal and vegetable production, because animals help to provide organic matter to the soil, contributing to its natural regeneration. Then we need less chemicals. An eco-friendly cattle industry is the key for an eco-friendly agriculture. Because a lot is said about how bad the animal industry is for the environment (in most cases, with exaggerated data), but the production of veggies, cereals, etc., also has a carbon footprint. A very high one if we’re talking about products like some vegetable oils, but also when we have to bring things from far away. And those crops require huge amounts of water, as well as chemicals. Part of this is unavoidable; another part could be mitigated, and as I’ve said one solution would be the coexistence of animals and plants, which has been lost in our productive systems, that tend to single-crop farming. Also, vegans talk about the gas emitted by cows, but not about how they can help to reduce greenhouse gas emissions through carbon sequestration: certain forms of grazing, that depend on the climate and need to be more studied but are all based on a more extensive system, contribute to increase this factor and therefore minimize the impact of this activity. However, it’s still true that we eat a lot of meat, and with the kind of systems that we’d need to introduce in order to make its production sustainable, we wouldn’t be able to consume as much as now. But that doesn’t mean that there are people who need to compensate by not eating any, rather, that everyone should make little changes. That seems like an utopia… but maybe if some ecologist groups were more inclusive and encouraged every change instead of being sectarian and despising omnivores, there would be more acceptance. Even so, I’m not naïve: a real change can only come if governments decree hard measures, and there are too many interests at stake as for this to happen overnight. I believe nevertheless that if we all join the fight together, put pressure on the authorities and above all convince the companies with our choices of consumption, little by little there will be changes. But for that we need to be able to fight all together. And I seldom feel welcome in the campaigns of the ecologists. Animals don’t have rights. But human beings do have duties towards them. And the treatment they’re given in many farms of massive production is condemnable. To me, this isn’t strictly an argument for veganism, since believing that something is bad is not the same as believing it’s good or bad depending on the conditions, as in this case. But I can’t either include it as one of my counter-arguments because it’s certainly what prevails nowadays and, given the price of the more ethical animal products, I understand that some people just choose not to consume them at all. It’s not the option I recommend, because despite everything I consider that people are more important than animals, and our body works better on an omnivore diet. But I get it. For a better solution, read the previous point. Therefore, if I’m worried about the planet and the animals but I don’t believe in veganism, what can I do? Buying category 1 eggs (free-range hens, with access to the outside). There are also 0, organically fed. Avoiding 2 (indoor housing) and 3 (cage farming). These are very few, and I admit it. Why? I haven’t dared to make more changes fearing it could harm my anorexia recovery. In addition, I was paralyzed because I didn’t even know where to start. But now I feel ready, and on the other hand I know I don’t have to do everything perfect, but every conscious choice matters. Getting even better in the first point that I’m already doing. Looking for more eco-friendly and ethic meat options, especially turning to local providers that can be trusted. With respect to the rest of animal products, researching the brands to choose the ones that have better conditions. Calculate, taking into account the differences in price, how much animal food I can consume in my diet, compared with how much I’m consuming now. Look for good substitutes so this doesn’t result in a nutritional impoverishment. Apply this mindset to the rest of my purchases, especially clothes and cosmetics. Avoid animal products at all as long as they aren’t essential. Don’t stop with the animals. Vegetable products: how have they been grown and transported? When is it worth it to buy organic and when isn’t? In short, becoming an ethical omnivore. Knowing that I’m always going to be on the way and, therefore, without feeling guilty for my previous choices when I find out better ones and, at the same time, without believing I’m morally superior, since I’ll have to admit I’m not perfect. Are you going to join this challenge with me? 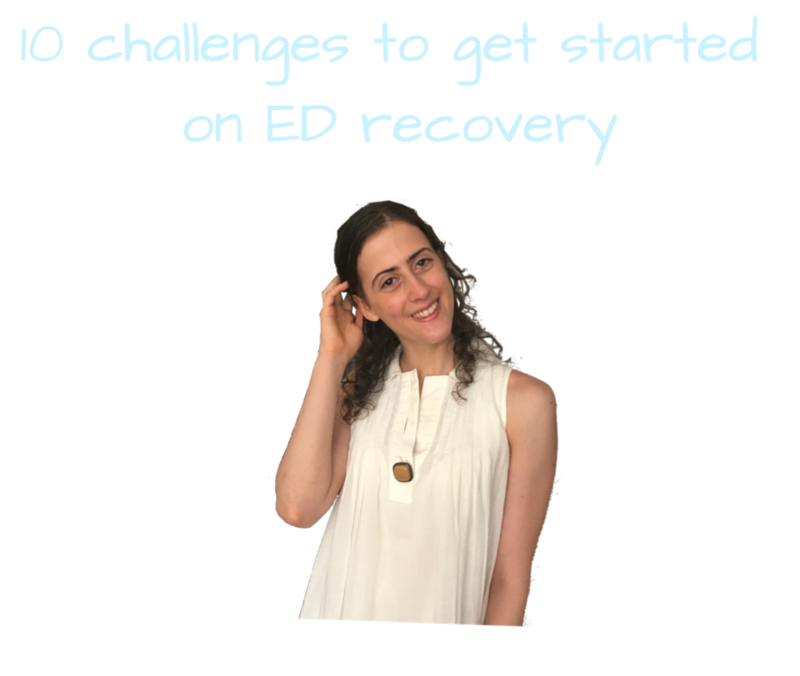 Sign up to receive this freebie I’ve made with love to help you kickstart your recovery. By providing your email you’ll be subscribed to my weekly newsletter.